Backward Compatibility on the Xbox One: How’s the List? It’s almost time. That famed firmware coming November 12, 2015 to the Xbox One that not only brings NXE (New Xbox Experience/Windows 10) but also backward compatibility with Xbox 360 games. Honestly many users will never use this feature, despite what Microsoft marketing has you believing. Then again, this seems to be the first generation where many of my friends straight up sold off last gen’s console and entire library to help fund their newest purchase, so who knows. Either way you will soon be able to play Xbox 360 games on your Xbox One, which will broaden the library of games you can play and hopefully see you returning to the classics that graced last generation. Oh wait, there’s a catch. You don’t get every game from the Xbox 360 and in fact you don’t even get 10 percent of every game released – digitally as well as at retail – but rather a list of exactly 104 titles available at launch. If you didn’t see a long list of games you don’t intend to ever replay coming, then you probably don’t have much experience with how things like this work. Now given how well the backward compatibility fared on the Xbox 360 for original Xbox (a good majority of the games were eventually playable in some form) we may very well see an impressive list spawn but for now there are only a strong handful of games worth boasting about. They are all long games though so you could probably kill about six months trying to replay what will be available. As of this morning the official list is out, I personally have been using the feature for almost six months, and the following article will tell you how it works, what to expect, and give my take on what games are worth utilizing this feature for. The functionality is built right into the Xbox One, so for the most part it works as you would expect. If you purchased the game digitally (including Games for Gold) it will appear in the list of games ready to be installed, just select and download. If you own a disc version of the game you will have to insert the disc and choose to install it like an Xbox One game, which results in the system verifying the disc is valid and then triggering a download of the game proper. This means you may have a wait on your hands because the average Xbox 360 game with this new backward compatibility wrapper weighs in about 7-9 GB and if you own DLC those will automatically download as well and could increase your download considerably. Once downloaded a digital game can be played directly whereas a disc-based game must have the disc in the console to launch, just like now. If you have for whatever reason downloaded a game and the DLC hasn’t been downloaded (or you purchased it after downloading the game) then you can find DLC available in the “manage game” area of any install. Note: Microsoft has announced that all 360 Games with Gold will now be backward compatible so you may want to get in the habit of grabbing titles of interest as they get announced because you no longer need a 360 to play them. As for how you can use, play, and purchase items for these games it can be a little different because you’re basically emulating the 360. One of the biggest initial changes is if you continue to use your regular Xbox 360 you may start getting notifications that your gamertag was used on another system. This is expected because your Xbox One running a 360 is more of a virtual 360 and therefore will be recognized as a “new console.” Your saves used on the Xbox One with 360 games will solely be in the cloud so be sure and upload your 360 game saves to the cloud on any game you intend to use on your Xbox One. The saves are so small and your space so large (10 GB at present) that it won’t take long or be a big deal. If you have no saves in the cloud the system will simply start a new save game in the cloud for you. All cloud saves can be re-downloaded and used on a 360 after starting life on the One, so essentially it’s full compatibility. DLC is as mentioned before also compatible and can be downloaded at the time of install or in the “manage game” section. If you would like to buy games/content for the 360 for use on your Xbox One, it gets slightly complicated. You either have to boot up an Xbox 360 console and make purchases in the store on that console that will also make them available to your Xbox One or you can use the Xbox website to log in and make your purchases that will also immediately become available on your One. The reason for this is that the marketplace/store was not emulated. If you would like a video of how this all works in action, I have made a demo video below (this was created before DLC was compatible). All Xbox 360 games running on the Xbox One are capable of features on that console such as screenshot capture, streaming, and multi-function (snap). Assassin’s Creed II: I know, why not the whole Etzio trilogy? Why not all of the 360 Assassin’s Creed games? I have no idea why not, but that doesn’t change the fact that AC II is probably the best game in the series. If you are going to return to the 360 on your XB1 for one more go as an assassin, it’s going to be Etzio and it’s going to be in Assassin’s Creed II. Don’t forget the feathers! Borderlands: It may not be the best Gearbox has to offer in the franchise, but the nostalgia factor on the original Borderlands is sky high. In addition I feel that most people traversed the original with a friend in co-op whereas there were many more lone wolves the second time around. That’s one of the big reasons to love backward compatibility: for a few bucks you and a friend can dive back in and re-live this great shooter, no 360 required. Condemned: We just did a game club, review, and video series where we showed this more than enough appreciation. It’s also $7 at Gamestop (prices go up since this list? It was like $3) and allows you to re-live it yourself. JUST DO IT! Fable II: See the reasoning for Assassin’s Creed II above, same reason. Fallout 3: Okay, so I have no doubt Fallout 4 is going to impress. That said, why not return to Bethesda’s original take on the classic franchise and not put that whopping $50 of DLC purchases to waste. Sure, it’s on PC, but it needs mods and all that hoopla to work. 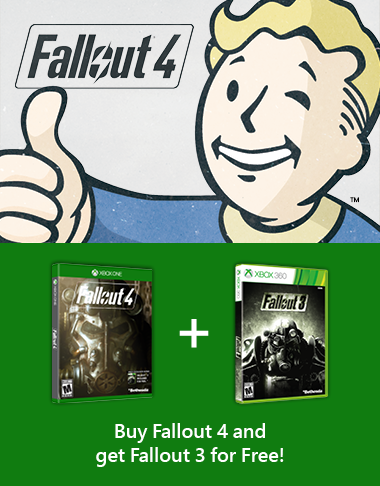 This is plug and play and it comes free if you buy Fallout 4 between now and February 2016. Gears of War Franchise: The only series on this list that got all of its games on backward compatibility day one. Even Judgement is on there, which myself and Jam appreciated a bit more than most. You also get all the games free if you bought Gears of War Ultimate Edition, but those games are all dirt cheap in used game shops anyway. Well worth a re-visit with a friend. Just Cause 2: Just in time for the sequel, remind yourself how awesome chaos was with a grappling hook. Mass Effect: I know, I know, it’s not the sequel. Apparently this is because Microsoft is struggling with multi-disc games at this time, but hopefully they get it ironed out. Mass Effect is still a great game and it’s going to run you 30-40 hours to complete. Besides, you need a save to import into that copy of Mass Effect 2 when it becomes available, why not get cracking. Mirror’s Edge: Great game, you should play it if you haven’t. Heck, you should play it again if you have. Just play it. Rainbow Six Vegas 1 & 2: This is massive for me. I loved these games and broke my back trying to get all of the achievement points. Unfortunately the online community for this game died quite early and definitely didn’t recover when the new systems came out. 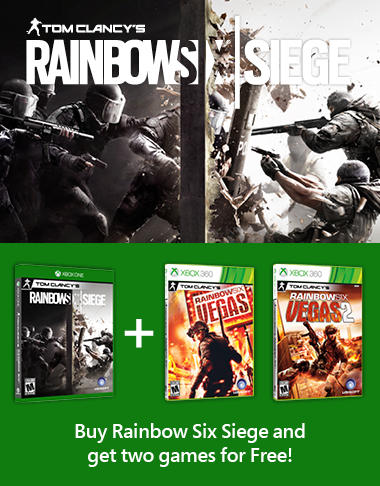 On the other hand, I don’t know how well Rainbow Six Siege will do and either way that title comes with a free copy of both Vegas games. My perfect world is a re-vitalization of these games with XB1 players so let’s see if we can make it happen. Basically Everything in the Rare Replay Collection: ‘Nuff said. Digital Titles: There are also a chunk of great digital games to enjoy like Trials HD, Shadow Complex, Ms. Splosion Man, and a slew of super retro titles like the Sega catalog, Ikaruga, Doom I & II/Wolfenstein 3D, Monkey Island 1 & 2, and of course my personal favorite Torchlight. Now you may be wondering what’s to become of the games not on this list. Well some are coming – Microsoft was quick to promise Halo Reach, Halo Wars, Call of Duty: Black Ops, The Bioshock Trilogy, and for some reason Skate 3. Others are noticeably absent like Red Dead Redemption, Black Ops 2, Skyrim, and probably about a thousand other games. Keep in mind that multi-disc titles are currently a stopping point, but none of the three aforementioned titles are multi-disc so there’s obviously a promotional or business holdout reason for these games. Either way, backward compatibility has its uses and could, with luck, revitalize certain online communities that have gone dormant. If not, no biggie, I can now safely migrate my 360 to closet status and only dig it out when absolutely necessary.